This week I was reminded just how wonderfully generous quilters are… I was gathering quilts to take to Project Linus and it hit me just how many people help make these quilts happen. 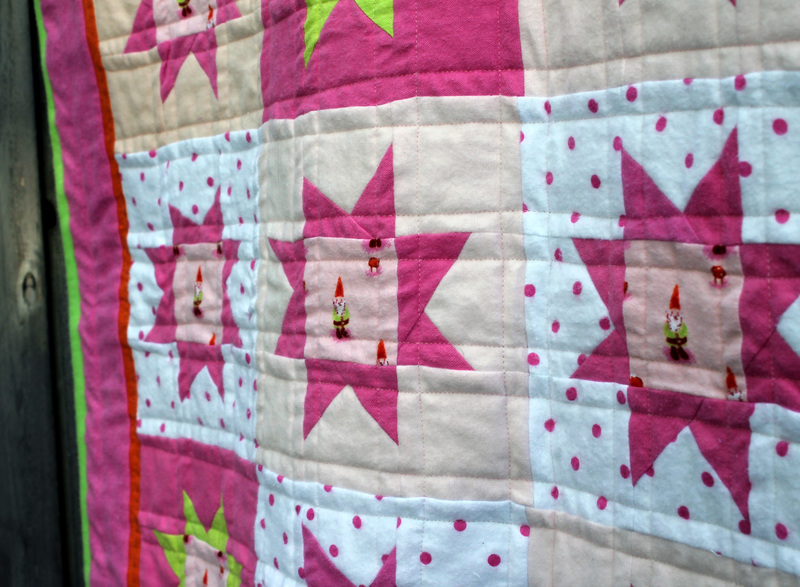 Here is a selection of this months donations, starting with my finished Gnome stars quilt…. I made this top a couple of weeks ago and finally got around to quilting it this week. 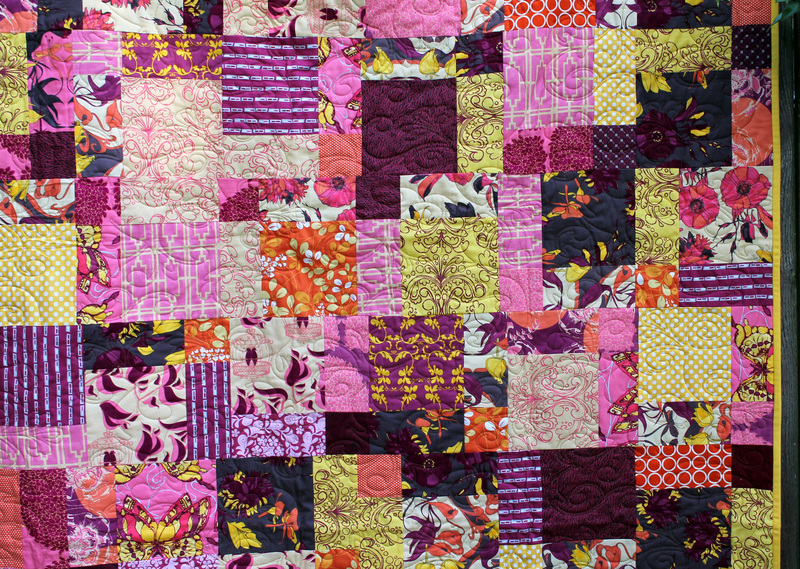 Quilting the flannel top and flannel back was an interesting process…. the flannel did not move through the machine as smoothly as standard quilting cotton… it took a little persuading. But it is so soft and cuddly and worth the extra effort. My big lesson with this quilt is do NOT bind in flannel. I thought I would do flannel all the way but the extra thickness of flannel makes binding in it bulky and unruly. 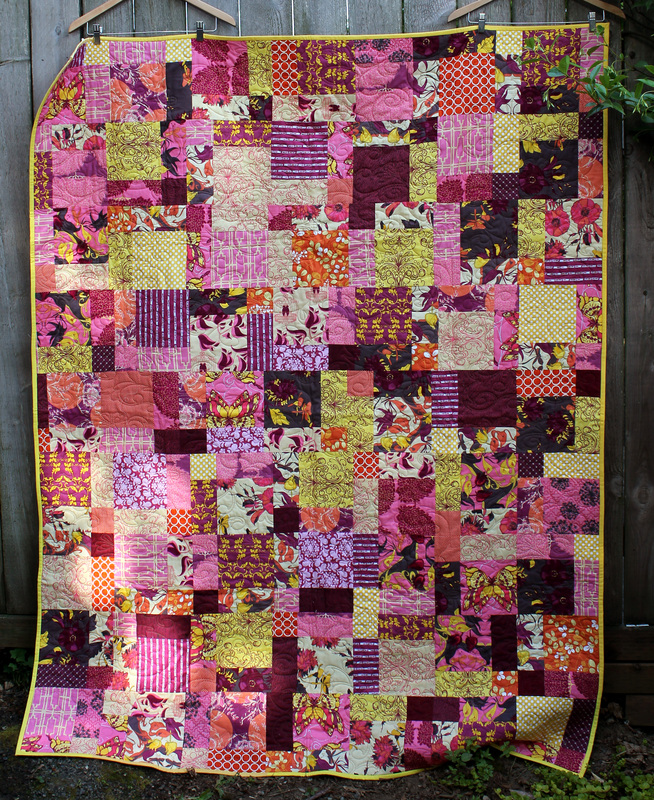 Next time quilting cotton binding all the way! We took a stack of fabric kindly donated by Sam Hunter…Tina Given’s “Haven” line…added a couple of blenders and spent the day making disappearing nine patch blocks. This quilt is destined to go to a local Foster kid who was graduating out of the system, so we wanted something a little grown up and a decent size. 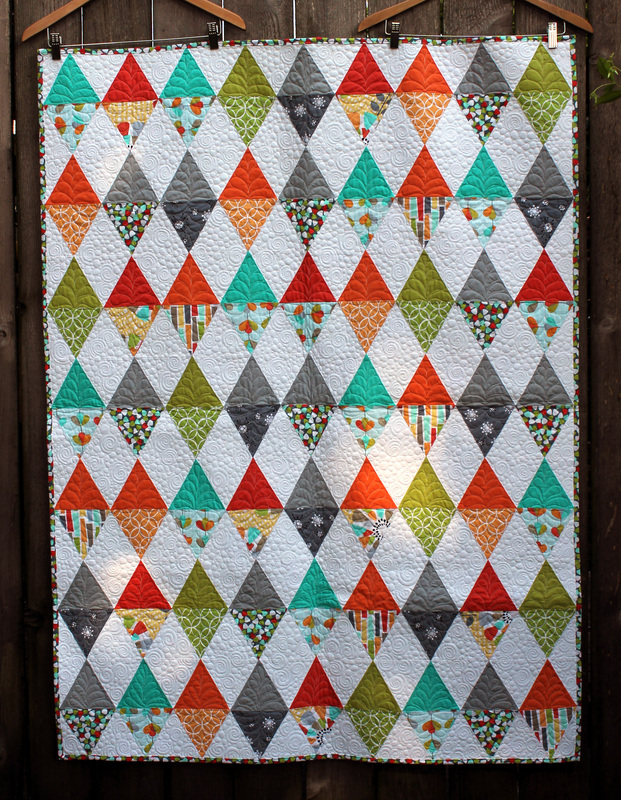 One of our fabulous guild members, Betty took the scraps left over from making blocks and made the most amazing back for this quilt. 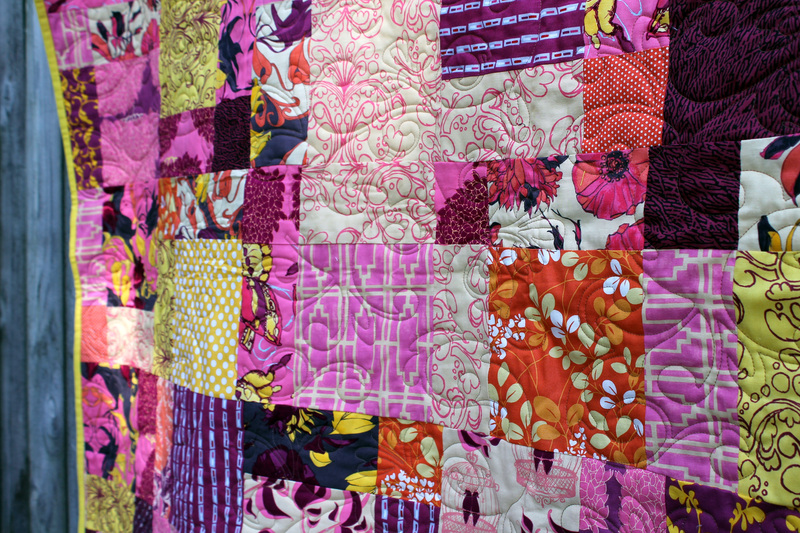 And one of our talented long arm quilters, Kazumi Peterson weaved her magic to put it all together…. with Cris Pera doing the final step of binding. It is truly a group effort. 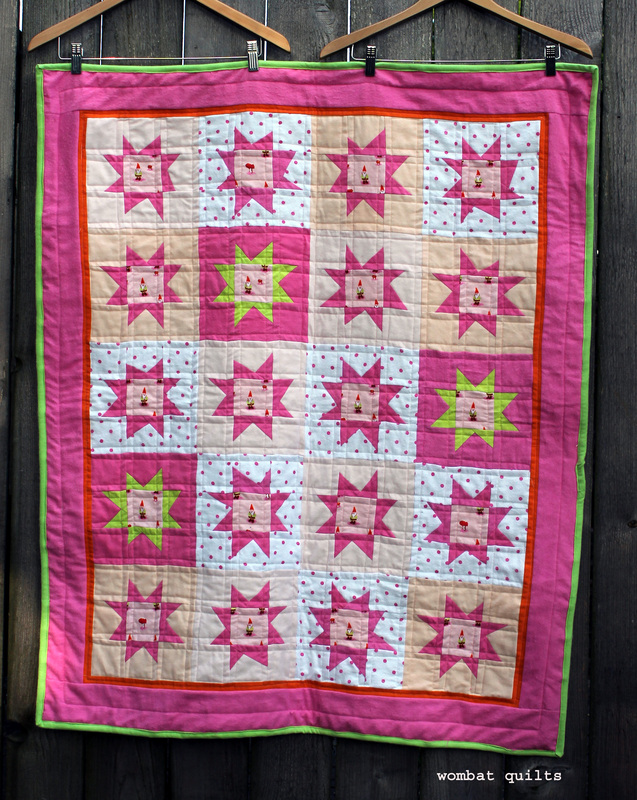 Kazumi also donated this beautiful quilt to Project Linus this month…. Her reasoning for donating this beauty was that the fabric was part of a Guild challenge and so it seemed appropriate that it would be part of the Guild charity quilt donations. I am sure a lot of you recognize the fabric….and I love what Kazumi did with it. (If you want to see what I did with it check out this post). 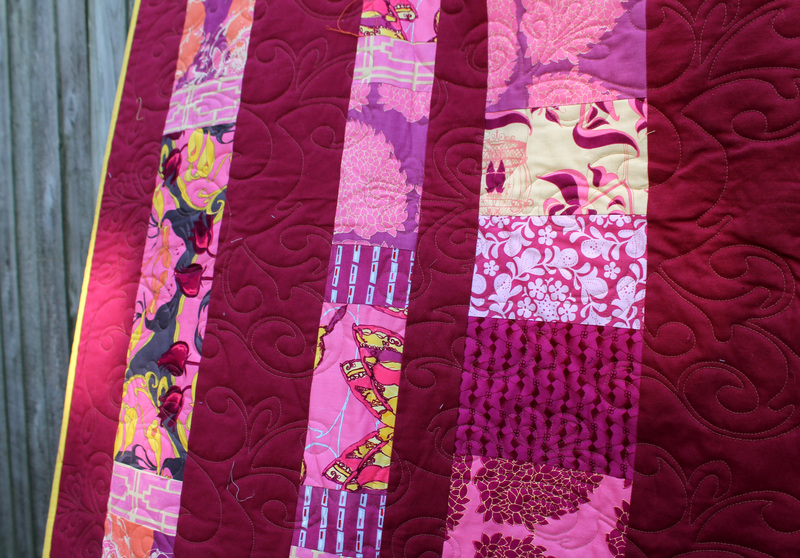 I had to throw in a close up of Kazumi’s quilting…I love it so much. 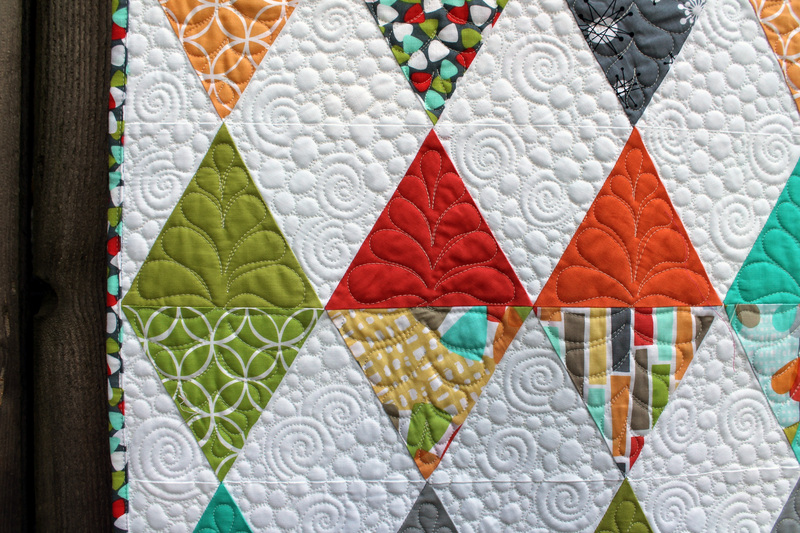 She really does beautiful work and I am not at all jealous of her quilting talent (okay maybe just a little jealous!). The final quilt I am going to share started as a donated UFO quilt top. …and once again one of our fabulous PMQG quilters, Gail Weiss weaved her magic, this time free motion style. All these quilts are destined to go out into the world and wrap someone in love..and none of it could have been possible without Sam, Elsa, Betty, Wendy, Kazumi, Cris, Dawn, Penny, Juline, Elisa, Anne, Suzanne, Pam, Jo, MaryAnn, Michelle, Gail, Rachel, Angie, Kathryn, Joy, Nancy, Jolene, Lisa, Lupine, Meredith, Meredith’s mum and all the members of the PMQG who give of their time, talent and fabric stash. Thank you. « A flurry of butterflies…. Wonderful quilts and the quilters that give their time! 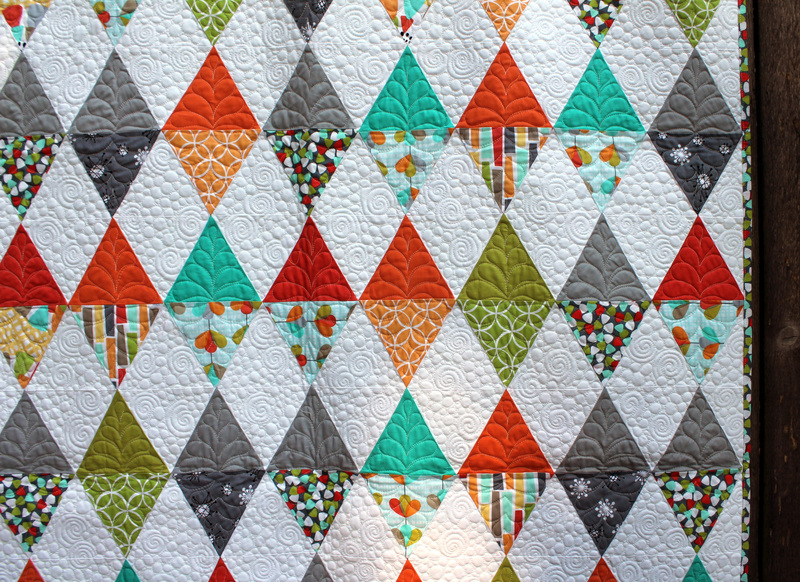 Wow that is some amazing quilting! I too ,belong to Project Linus in Brisbane.i am constantly amazed at the finished quilts at tops that are donated. We have an eighty six year old quilter who makes te loveliest quilts When the new Lady Ciilenio Childrens Hospital opened this year all the beds had quilts and the children get to take them home. Adele. My sister and I were are part of Project Linus in Brisbane right at the start. She was an Oncology nurse at the Royal Children’s and I was the quilter. She worked with the Quilt Store near Indooropilly to get things going. That was in 2000…a long time ago. 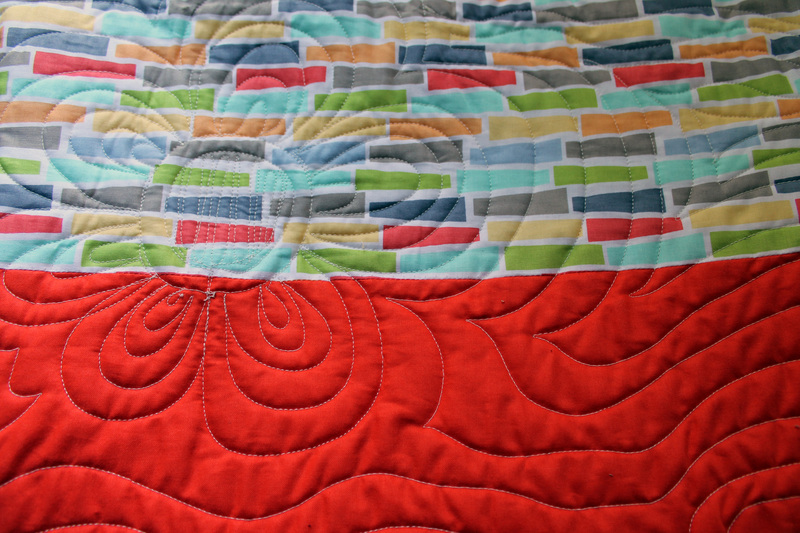 Your photos made my free motion quilting look great! And THANKS to you for all the organization – it’s not an easy job! Gail…I forgot who had quilted Elsa’s quilt. I’m am so sorry. Amending my post immediately. So many quilts go out each month I loose track. I’m need to be better about it. These are gorgeous! I think the quilt will make a lovely gift. Boy oh boy, these are wonderful. The end result and the giving is marvellous, but the quilters also have the pleasure of working together. The perfect project. 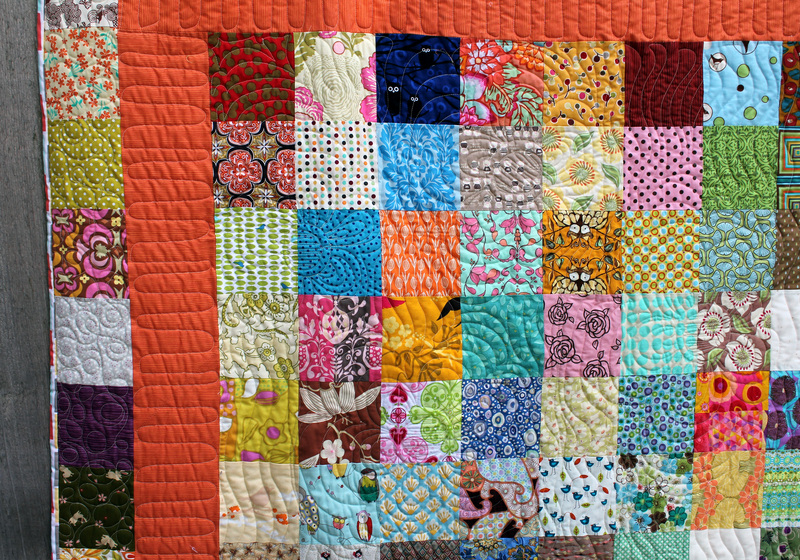 Such wonderful quilts that I am sure are very much loved and appreciated by their recipients. Beautiful quilts made by beautiful people. Thank you, Cath for your kind words. You take awesome photographs. Sorry I’ve missed the last 2 charity sew days. Hopefully, I’ll be in town to make the next one. 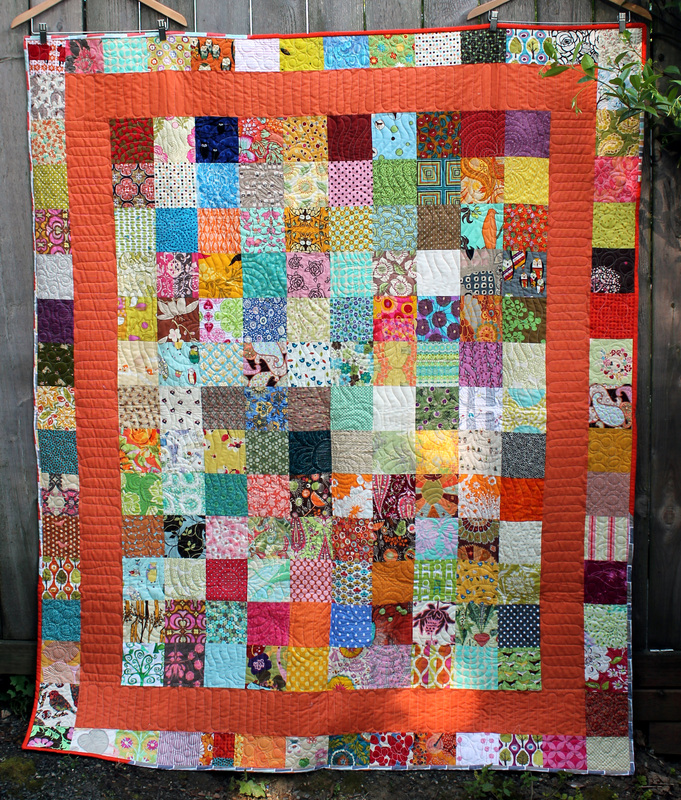 I also belong to a group that makes quilts for Project Linus. 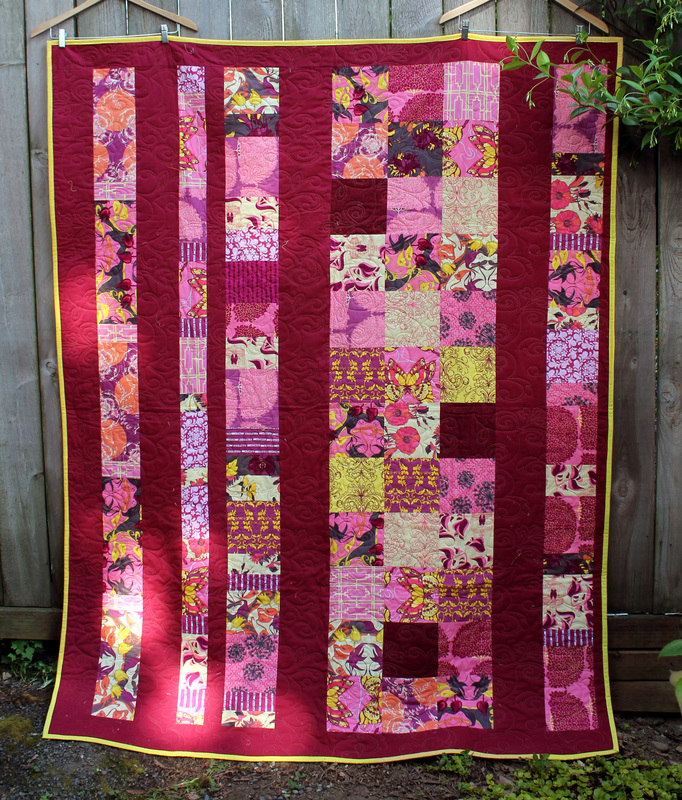 Thanks for showing your lovely quilts! We don’t always know who the quilts go to, but we know that they are all appreciated. I also belong to a group that makes quilts for Project Linus in Los Angeles. Thank you for showing your quilts and putting the word out for Linus. We may not know who gets the quilts, but we know that they are appreciated and loved. What a wonderful contribution that you are all making! Absolutely wonderful quilts made by wonderfully big-hearted people! My first trip to your blog as I wanted to mention you to a Texas friend. Thank you for the shoutout for the March quilt back. Your Charity Quilt sewing meetings are my favorite day of the month.